For online business Edmunds.com, a popular resource for North American shoppers interested in buying a car, the move into their new Santa Monica headquarters in the summer of 2016 coincided with the company’s fiftieth anniversary. 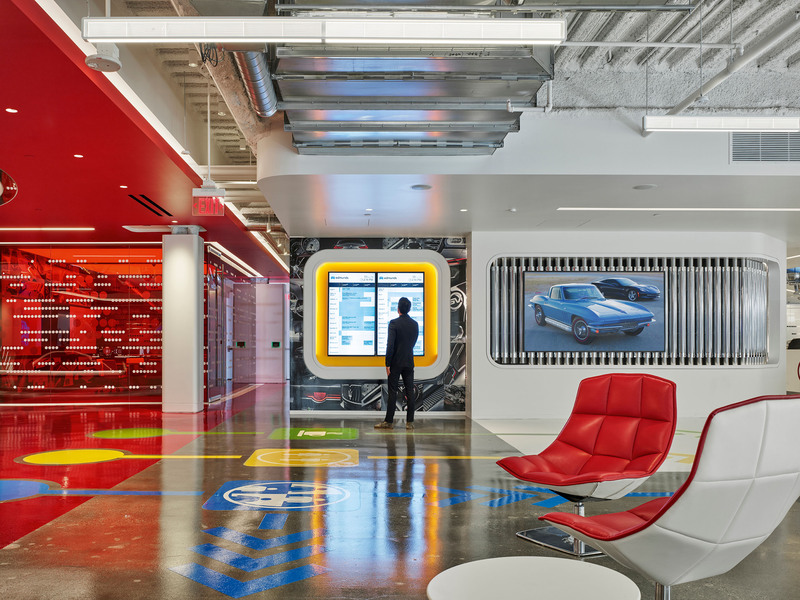 To mark this important milestone, Las Vegas-based M+M Creative Studio created an inspiring office interior for Edmunds staff that celebrates all things automotive. An important ingredient that repeatedly surfaces in the architects’ design is Corian®, which was utilized throughout the sprawling 13,000-square-meter complex. 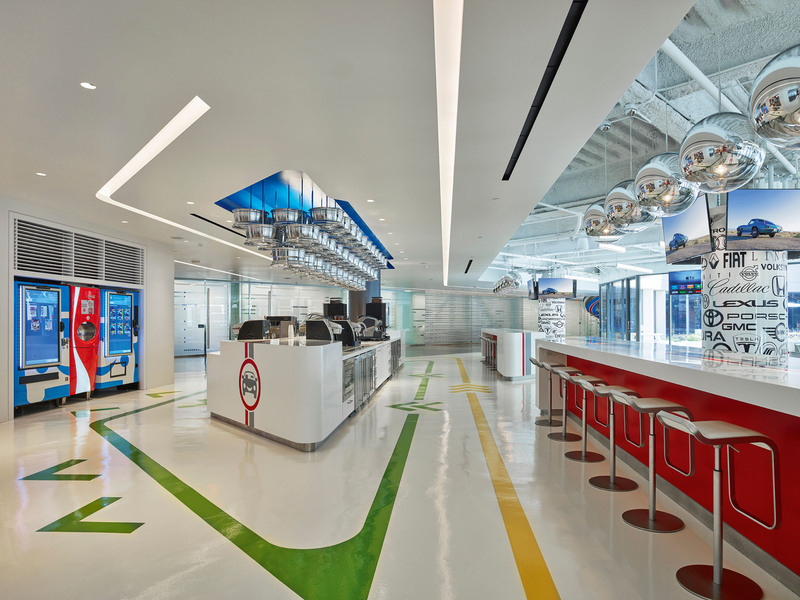 “We wanted the visual cues in the office to be polished to give the impression of a newly waxed car and, with the proper surface finishing, Corian® works perfectly, providing the glossy look we were looking for,” says Chris Mitchell, CEO of M+M Creative Studio. At the entrance, visitors see a sleek 2016 Corvette automobile suspended upside down over a mirror-polished stainless steel reception. Set into the desk’s oval countertop is a Corian® surface in Designer White tone with an elegant stripe in the Royal Red and Silverite shades that recalls those seen on racing cars – the same three Corian® colors are used elsewhere in the office. The racing stripe motif is most prominent in the ground floor coffee bar, where Mitchell installed a nearly 13-meter-long block with built-in sinks in Corian® beneath a chrome wheel radial chandelier. 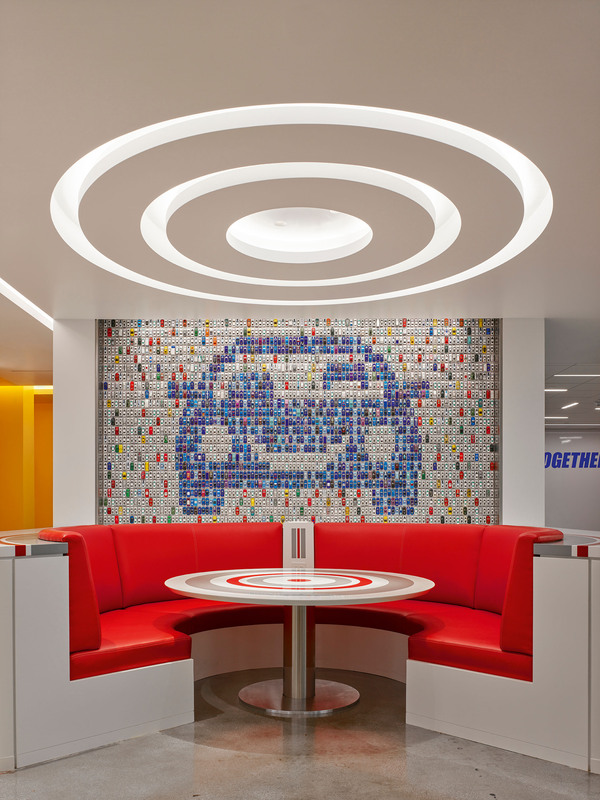 “The streamlined Corian® recalls the seamless designs you see today in cars. It has no joints or crevices, which makes things easy when you have to clean up espresso grinds at the bar,” explains Mitchell. The surface was used to fashion ultra-smooth sideboards in meeting and conference rooms and as a border around two aquariums located next to employees’ desks. The architects also came up with the idea to insert tiny alcoves fashioned from Corian® into the walls that could serve as recharging stations for staff members’ electronic devices, allowing employees the freedom to move around and not be confined to their desks. In a break area, the architects designed a table with tapered edges in the material and reinterpreted the racing motif in a circular pattern. “It is a surface that helps the overall design that we were aiming for to convey movement and fluidity,” adds Mitchell, whose project was recently recognized with the inaugural American Architecture Prize.